What product will provide the proper retention? Will a drainage system be required for the wall? What is the quantity and type of base material required for the application? Will a permit be required? Todd's Services will determine all of these factors when we evaluate your site. 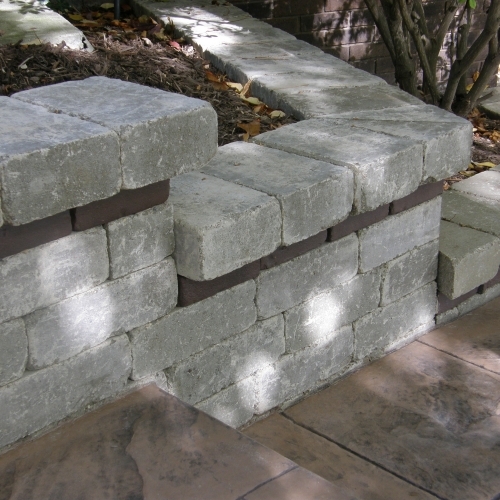 We have over 35 years of experience installing retaining walls in Michigan. Too often, walls are installed without proper consideration and can become dangerous or they fail to provide proper retention. Josh Robinson worked with our site constraints and came up with terrific solutions. Project Manager Jeff, and lead installation man, Gary and his crew were great in executing the project in the amount of time promised. There were no shortcuts or sloppy work, everything was expertly installed with the right materials in the correct manner. The crew showed up on time as expected everyday. They were friendly, polite and worked very hard since our site was not the easiest to move material around on. The retaining walls had the appropriate drainage install and I am confident that they will will do the job and outlast our time in this house. All of the site materials were cleaned up and the final project area looked excellent. The care and expertise put into our project shows and was well worth the money spent on the project. We highly recommend Todd's Services because they are truly experts in the field and great to work with from design to cleanup." Our retaining wall looks amazing. It's obvious Francisco takes great pride in his work. Couldn't be happier! Sincerely, Blake and Mary Gross." You did a great job from start to finish. The work you did is very functional (retaining walls, drainage, sod & irrigation) but it looks so beautiful, it looks like we had the stone steps and the boulders put there for aesthetics rather than function. We also had a very good customer service experience with every employee we dealt with; including sales, office staff and the landscapers. Thank you!" Our property presented a little bit of a challenge - due to sloping hills and sandy soil. They provided us with excellent alternatives to having to create expensive retaining walls. Todd's came out with HEAVY-DUTY equipment to fine grade the property in preparation for their Hydroseed. Even when some of their equipment came in contact with our TV/Internet cable, they immediately got a service personnel on our site to reconnect our service. We already have a little bit of green grass already sprouting! Hopefully, we didn't lose too much from wash-away. Todd's Guarantees their work." ★★★★★ - Kim and Tom, Putnam Twp.